There's 3 different ways you can connect your home network in your home office or remote office: wired network, wireless network, and a hybrid network. A hybrid network is a combination of wired and wireless. Hybrid networks are very common now. 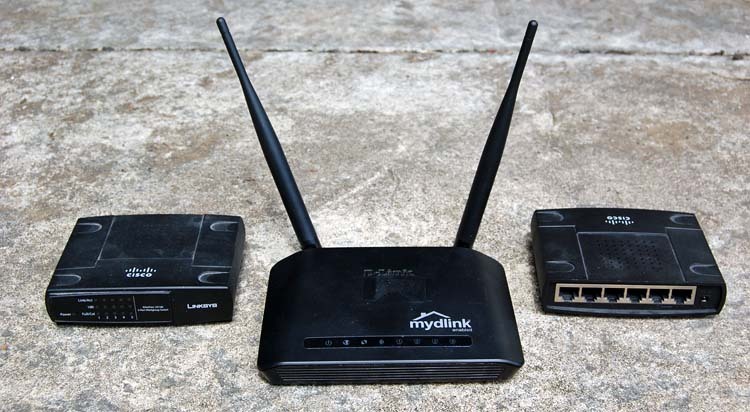 In this article I'm going to discuss the 3 different kinds of home networks. I'm also going to compare the advantages and disadvantages of wired and wireless networks. To give you an idea of the network I run at home, here's my home network diagram. This is a standard home network for remote workers or a small business office. When people talk about a wired network, they are talking about an Ethernet connection. Ethernet is the cable that connects your computer to your Internet router or Ethernet hub. The cable is called an Ethernet cable or Cat 5, short for Category 5. There are also higher standards like Cat 6, but for most home offices, Cat 5 is perfect. The ends of the Ethernet cable use and RJ-45 connector. One thing to remember is that you shouldn't have an Ethernet cable longer than 328 feet or 100 meters. When talking about a wireless network for your home or remote office, most people use a WiFi network. You could also use a 3G or 4G connection from your carrier, but it's more cost effective to connect all of your computers, printers, etc. with a WiFi network. When talking about WiFi networks there's a lot of different standards. Make sure all of your equipment is compatible. New WiFi Access Points usually work with older equipment, but older WiFi equipment may not work with newer equipment. If you want maximum wireless speed, make sure all the equipment is using the latest protocols and technologies. No sense in spending a lot of money on a new WiFi Access Point if all of your equipment is older and running an old protocols. If you want detailed information on the different WiFi protocols and standards, please read this article by Grand Metric – Evolution of WiFi Standards. A hybrid network has Wired and Wireless components. A good example of this is the newer routers you when you subscribed to a cable modem service. The router usually has 4 Ethernet ports and a WiFi hub. So you can connect some equipment with an Ethernet cable and some equipment using WiFi. This is pretty cool. So is one network better than the rest? Yes, but it depends on what you are trying to setup. Wired networks are consistently faster. Wireless networks are less secure than wired networks, but there have been big improvements in wireless network security. Wireless networks are susceptible to interference from other wireless networks or devices, e.g. cordless phones, microwaves, neighbours network, etc. Not all wireless routers and devices will work with each other. this is due to the different protocol standards that were discussed earlier. Cheap and easy to install because there are no cables to run. 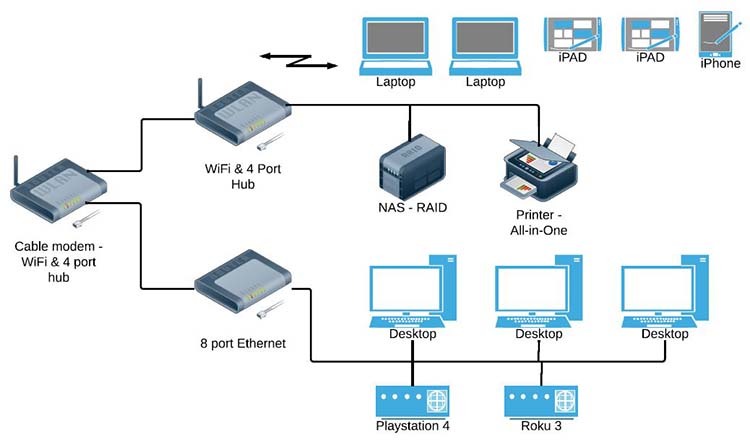 Can support a lot more devices with one WiFi Access Point compared to an Ethernet hub. Can connect mobile devices to your network or the Internet. When setting up your WiFi network, make sure your network is secure as possible. Use the best encryption protocols your network can support and use a strong password. Make sure your devices support the same protocol as your WiFi Access Point. And make sure they are configured to use the same protocol. What wireless protocols do your existing devices have? What wireless protocols will your future wireless protocols have? Does it have wired Ethernet ports? What is the range of the WiFi signal and how big of a space do you want to cover? Can you remove the antenna and use a better antenna or add a cable to move the antenna to a better location? I hope this article helps you setup your home network. If you are using a WiFi hub, don't forget to change Login credentials for the WiFi Access Point and the Login Manager. If not, you may find a neighbor using your Internet access or worse case a bad character accessing your network.